RIO DE JANEIRO — It's one thing to say you're going to win an Olympic medal or two. It's another to plan out every step in minute detail — on laminated flash cards, even — the way Tianna Bartoletta does. The 30-year-old American is one of those rare throwbacks — trying for sprint medals in the 100 and the relay, while also focusing on her day job, the long jump, where she's the defending world champion. It makes her busier than your average Olympian, and she's got the perfect system to handle it all. Printed on cards , in near minute-by-minute detail, are her daily routines for pretty much everything — practice days, long jump days, sprint days, transportation, meals, packing her suitcase, and so on. "We have laminated cards to give to the cab drivers," said Bartoletta's husband, John, who doubles as her team manager. "We treat it like a business. That way, it takes everything off her mind and allows her to run free. When she's on the line, there's nothing else she'd even need to think about." There are legendary Olympic stories about missing bibs, late buses and other attention-diverting mishaps that come on the athletes' biggest days. Shouldn't happen in this case. That sort of organization helps explain how Bartoletta put together a second act in track and field. 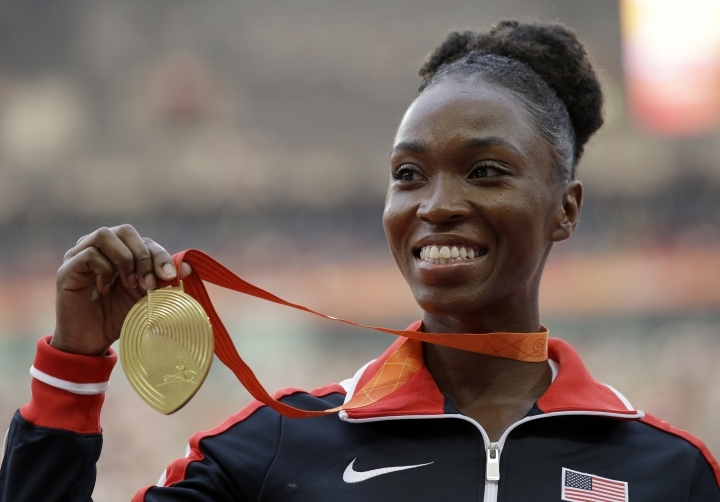 Her world title in long jump last year came a full decade after she won the championship the first time, back in 2005 when she went by her maiden name, Tianna Madison. She described herself as on the verge of quitting during her lowest points "but I was still competing just to make money for tuition, because I planned to go to school." "I felt I didn't have it anymore," she said. "I felt it was embarrassing to once be the world champion and not be able to jump 21 feet anymore. It was my time to go on and move onto other things." Right around her lowest point, she met her future husband, a hedge-fund trader in Florida who took a lot of what he learned in the financial world and brought it over to the track. "She wasn't training, was overweight, having some struggles," John Bartoletta said. "I told her, 'I would never tell you what to do, but I'll give you some options.' It didn't happen at the kitchen table. It was a deep, intellectual discussion of her options." It meant recommitting herself to a new training regimen, better diet, better planning. John Bartoletta did more than talk the talk; he designed an improved training program for himself, as well: "If she's (going to do it), then I'm not eating a piece of pizza in front of her," he said. "In fact, I'm going to train myself like an Olympic athlete ... because if she's doing it, I'm going to do it." The truest test of their planning came at Olympic trials, where Bartoletta was trying to qualify for the 100 and long jump — events that were literally going on at the same time. She had to take her first jump, then get to the starting line for the 100-meter heats, then back again. "The plan wasn't to win, the plan was to make the team" by earning a top-three spot in each event, she said. "We executed it beautifully." Given the stress of that day, the Olympics will feel like a breeze in some ways. The women's 100 final is set for Saturday. The long jump starts next Tuesday. 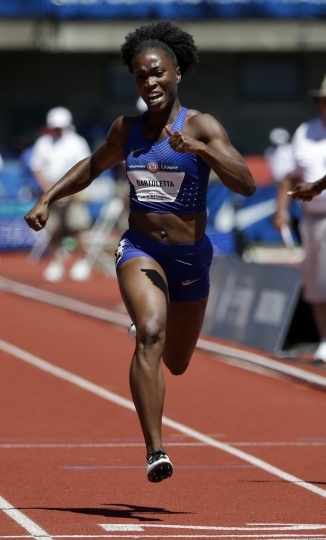 While the women's 100 — featuring Americans Tori Bowie and English Gardner and two-time defending champion Shelly-Ann Fraser-Pryce — is considered possibly the most competitive event on the program, Bartoletta will be among the favorites in the long jump. She'll also be in the mix in the 4x100 relay — an event where she already has a gold medal, courtesy of her role as the lead-off runner in the world-record trip around the track (40.82 seconds) in London four years ago. "Something magical could happen" in Rio, her husband said. "If we get her to the track and she makes the semifinals and performs there, the rest of the week will light up. She'll do very, very well."